Only Wine Glass of Brains Would Turn Fool To Wise Man It's Last Ounce That Counts, Says Dr. Todd, in Telling Physicians Story W. R. U. Found in Misfit Corpses. By Fred Charles. It's the last ounce of brains that count for success or failure in life. Dr. T. Wingate Todd, professor of anatomy in Western Reserve university medical school, advanced and defended that theory last night at the annual banquet of the American College of Physicians in Hotel Cleveland. He draws his conclusions from a study of hundreds of brains taken from the skulls of Cleveland's social failures from 1913 to 1923. He has correlated these studies with general industrial conditions as revealed in records of the Associated Charities. Bodies that come to the medical college for dissection are those of the poor who die during periods of hard times or who commit suicide. They are, as a rule, those persons who are unable to weather the storms of adversity. They are the "failures" of the city's industrial life. The average human brain volume is 1,500 cubic centimeters. Virtually all of those misfits who were sent to the medical college after death had brains of smaller volume than the average. They hadn't enough brains to fight through and keep alive when the pinch of hard times came. But Dr. Todd reported that those who succumbed during a severe period of industrial adversity had more brains than those who died during ordinary good times. In other words, in a severe period of hard times, even the man with a fairly good brain supply has difficulty in weathering the storm. Through the cooperation of the city and welfare organizations, bodies sent to the medical school are properly identified, and often it is possible to get individual histories. This is an advantage enjoyed by very few medical institutions, which usually receive only the unidentified dead. Dr. Todd told of medieval misconceptions of the nature and function of the brain, which for centuries was a medical puzzle. "Of one thing I am sure," he said, "namely, that class distinction, in our highly artificial and fluctuating society today, is not the crowbar wherewith to pry open this problem of brains. And so we have tried another tool put into our hands by luck. "Ever since 1913 we have kept a steady watch upon head size and brain volume of those unfortunates who, having ended their days already, terminate their corporal existence under our care. Mean Volume 1,500 C.C. "The average brain volume for the adult white man is generally accepted as about 1,500 cubic centimeters - perhaps a few more, probably no less. Among the diners here tonight, who may be classed as highly intellectual, the mean volume is probably 1,550. "Now, the average among Cleveland's social ineffectives from 1913 to 1917 was quite constantly within 10 cubic centimeters of 1,480. This difference made no impression on us until in 1918 a strange thing happened. Our average fell to 1,410. "During that year, none but the veriest fool was left destitute; the others were all in the army or earning good wages in civilian life. Still we were not stirred to attention. 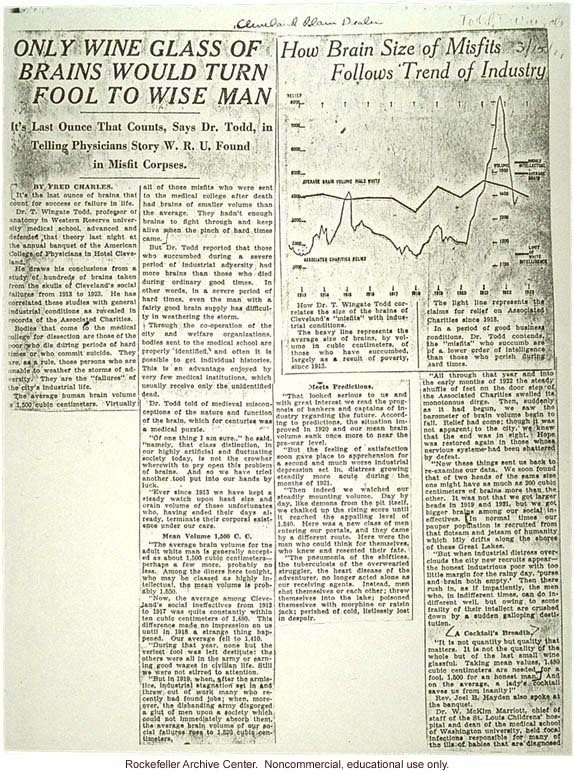 "But in 1919, when, after the armistice, industrial stagnation set in and threw out of work many who recently had found jobs; when, moreover, the disbanding army disgorged a glut of men upon a society which could not immediately absorb them, the average brain volume of our social failures rose to 1,520 cubic centimeters. Meets Predictions. "That looked serious to us and with great interest we read the prognosis of bankers and captains of industry regarding the future. According to predictions, the situation improved in 1920 and our mean brain volume sank once more to near the pre-war level. "But the feeling of satisfaction soon gave place to apprehension for a second and much worse industrial depression set in, distress growing steadily more acute during the months of 1921. "Then indeed we watched our steadily mounting volume. Day by day, like demons from the pit itself, we chalked up the rising score until it reached the appalling level of 1,540. Here was a new class of men entering our portals, and they came by a different route. Here were the men who could think for themselves, who knew and resented their fate. "The pneumonia of the shiftless, the tuberculosis of the overwearied struggler, the heart disease of the adventurer, no longer acted alone as our receiving agents. Instead men shot themselves or each other; threw themselves into the lake; poisoned themselves with morphine or raisin hack; perished of cold, listlessly lost in despair. "All through that year and into the early months of 1922 the steady shuffle of feet on the door step of the Associated Charities swelled its monotonous dirge. Then, suddenly as it had begun, we saw the barometer of brain volume begin to fall. Relief had come; though it was not apparent to the city, we knew that the end was in sight. Hope was restored again in those whose nervous system had been shattered by defeat. "Now these things sent us back to re-examine our data. We soon found that of two heads of the same size one might have as much as 200 cubic centimeters of brain more than the other. It was not that we got larger heads in 1919 and 1921, but we got bigger brains among our social ineffectives. In normal times our pauper population is recruited from that flotsam and jetsam of humanity which idly drifts along the shores of these Great Lakes. "But when industrial distress overclouds the city new recruits appear - the honest industrious poor with too little margin for the rainy day, 'purse and brain both empty.' Then there rush in, as if impatiently, the men who, in indifferent times, can do indifferent well, but owing to some frailty of their intellect are crushed down by a sudden galloping destitution. A Cocktail's Breadth "It is not quantity but quality that matters. It is not the quality of the whole but of the last small wine glassful. Taking mean values, 1,480 cubic centimeters are needed for a fool, 1,500 for an honest man. And, on the average, a lady's cocktail saves us from insanity!" Rev. Joel H. Hayden also spoke at the banquet. Dr. W. McKim Marriott, chief of staff of the St. Louis Children's hospital and dean of the medical school of Washington university, held focal infections responsible for many of the ills of babies that are diagnosed [illustration] How Brain Size of Misfits Follows Trend of Industry [graph] [caption]How Dr. T. Wingate Todd correlates the size of the brains of Cleveland's "misfits" with industrial conditions. The heavy line represents the average size of brains, by volume in cubic centimeters, of those who have succumbed, largely as a result of poverty, since 1912. The light line represents the claims for relief on Associated Charities since 1912. In a period of good business conditions, Dr. Todd contends the "misfits" who succumb are of a lower order of intelligence than those who perish during hard times.